I love a good time travel movie. As a Sci-Fi fan, it’s hard to go wrong with time-travel (although I’m sure it has been done). So, when I first saw trailers for “Looper” I was excited. 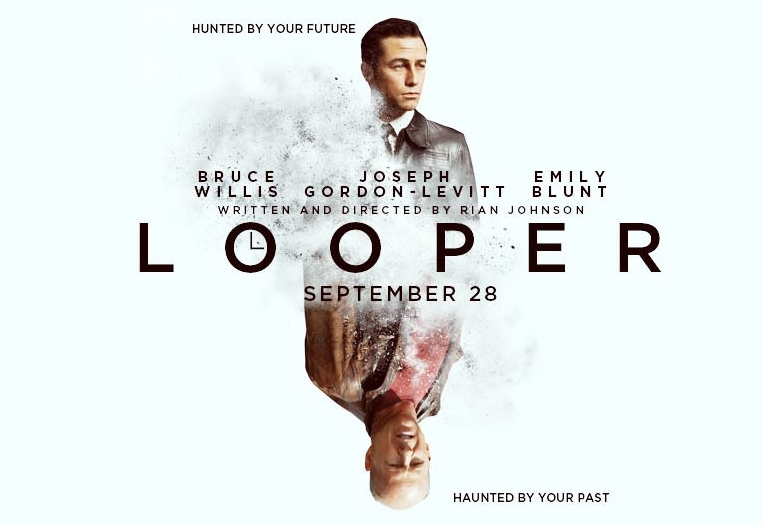 “Looper” is about an assassin, living in the year 2044. His targets are sent to him from 30 years in the future, where time travel exists, although it is banned. He kills them, making clean up easy since his targets don’t exist in his time, and there is nothing for the police to find in the future. When his contract is up, his last target sent to him is himself. It becomes even more complicated when Joe (Gordon-Levitt) accidentally lets his future self escape, and has to hunt him down (while also being hunted down by the mob that hired him). 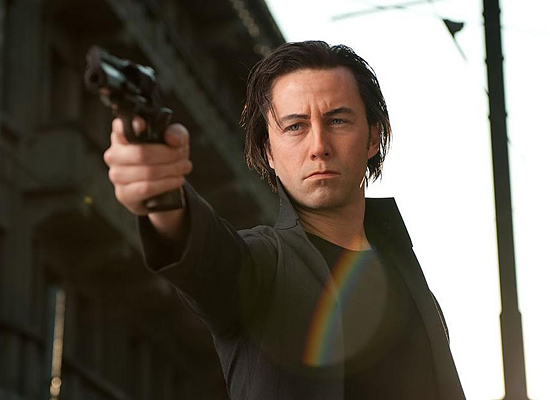 When I first saw the trailer for “Looper”, I was intrigued to see more of the make-up job they did on Joseph Gordon-Levitt to make him look more like Bruce Willis. It was quite bizarre at first to see him with a totally different nose and eyebrows, but after a while I adjusted and it really does help you imagine him to be the character. It makes him look a bit harsher, and you stop seeing the softer face of Gordon-Levitt, and you see the face of a killer (not that Bruce Willis is a killer – I don’t really see Bruce Willis necessarily in the face of Gordon-Levitt, even with the make-up job). ..and I did notice that they didn’t bother matching Joseph Gordon-Levitt’s ears to Bruce Willis. The movie itself has fun with the idea of time-travel, and has a couple new takes on the idea – and originality is always good when it comes to messing with the timeline. As always, I don’t like to give away too much plot. I enjoy seeing movies without knowing too much about them, so I try to stick to that when talking about it. However, there is one amazing scene in the beginning which really plays with the idea of time. Time for one “Spoiler”, even though it takes place in the beginning of the movie – or close to the beginning. After one of Joe’s friends lets his future self escape, the mob needs to hunt him down. Of course, they can’t kill him in the present (that would mess up the timeline too much), so they need to persuade his older self to come to them “willingly”. How do you do that? By chopping of pieces of his younger self of course. The audience gets to watch as this older man watches parts of himself disappear as he tries to stop the mob. By the time he makes it he is missing both legs, most of his arms, his nose…it’s disturbing. But it’s also one of the more original ideas I’ve seen – and by far my favorite part of the movie. 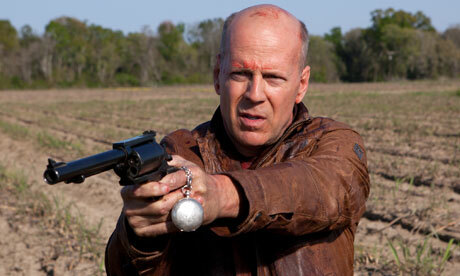 “Looper” does have a lot of action, most of which is gun fights. There is some telekinesis, but I’d rather leave that for those who go watch the movie. 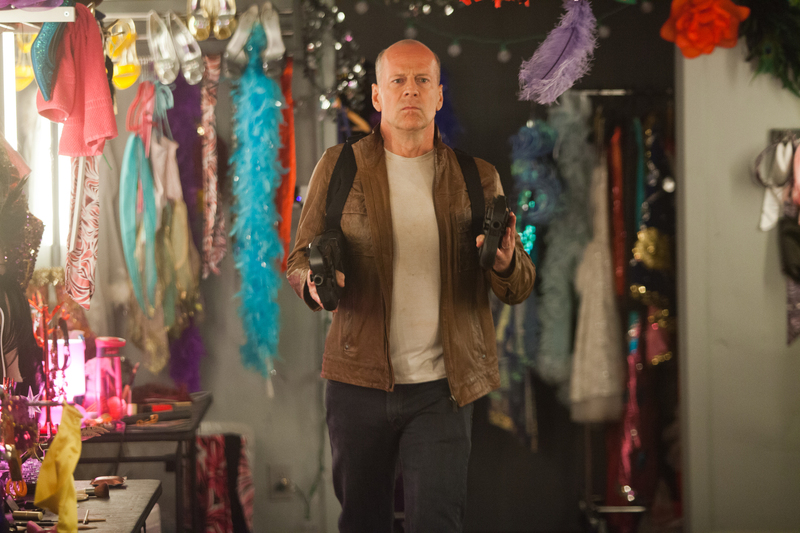 Movies like this usually need a lot of action (especially when you have Bruce Willis as one of the primary characters), because you get a larger audience with action. Joe (Gordon-Levitt) the Looper assassin. Joe again (Willis) later in life. Still sporting his gun. Thankfully, even with all the action, the plot does not lack. Not that it couldn’t have been better (there are many better time travel movies out there), but it was still a great story. Between the action scenes, the audiences begins to understand, pity, and sometimes even relate to, these two Joes; the same person but so very different. You have the conflict of the younger, who wants to enjoy his wealth and youth, and the older, who is wise because of the past but lost and desperately trying to hold onto it. You understand both of these men, but are torn during the movie by who you think is “right”. A great action movie, but also the potential for an even better movie underneath. 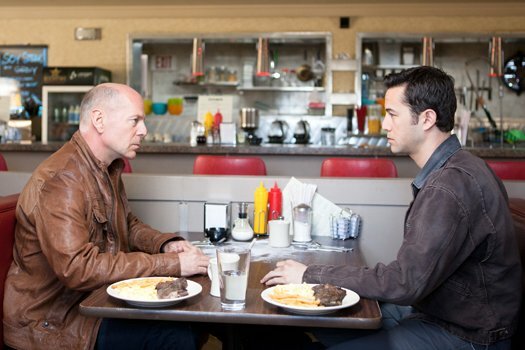 “Looper” could have been a much deeper and richer plot, if filmmakers are willing to take risks and have less action. Younger Joe (Gordon-Levitt) wants adventure and wealth. Future Joe (Willis) embraces his comfort and love. Although, I have to admit, the action is definetly worth it when Bruce Willis walks into a room presenting P90s, full on Teal’c style from “Stargate: SG1”. This entry was posted on October 30, 2012 by Kiki. It was filed under Film Reviews, Uncategorized and was tagged with Bruce Willis, Film, films, Joseph Gordon-Levitt, Looper, Movies, review, Reviews, Time Travel.